The Leela Palace Kempinski New Delhi represents the magnificent architecture, grace and elegance of Lutyen’s Delhi. Experience luxury of oversized suites and guestrooms of 550 sq. ft. and above, equipped with the latest technology. Dine at any one of the many über chic restaurants. Rejuvenate at an exclusive spa by ESPA. 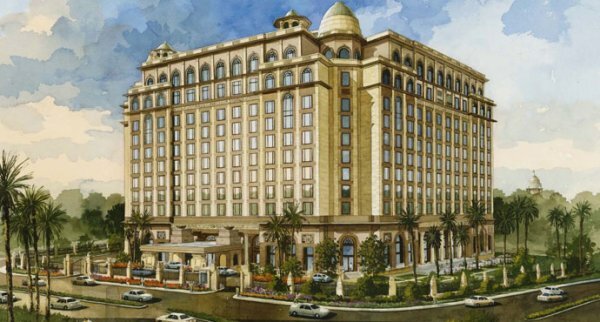 The 260 room Leela Palace Kempinski New Delhi is located in the exclusive Diplomatic Enclave. It is in close proximity to the Presidential Palace, Prime Minister’s office, ministries, embassies, central business districts and historical monuments. The rooms are one of the largest in the capital spanning more than 550 sq.ft. and the Presidential Suite sprawls over 4300 sq.ft. with all state-of-the-art amenities. Designed by Jeffrey Wilkes, ESPA at The Leela Palace New Delhi draws inspiration from India’s glorious traditional heritage but fuses this with the contemporary style of the present found in cosmopolitan New Delhi. The spa is designed on two levels: the active Spa is on level one whereas the passive Spa can be found on level two. The active Spa featuring the fitness studio, male and female changing rooms, social relaxation lounge and a Spa café that offers an exciting variety of delicious, healthy cuisine options. The active Spa features heat experiences in sauna, steam and drench showers; the perfect place to unwind after a treatment or exercise. The passive Spa is on level two: a purely tranquil for the spa treatment rooms, female relaxation room, roof terrace and the finishing Studio. The Spa features seven treatments rooms and a private spa suite. The private spa suite offersAyurvedic-influenced treatments such as the Kiziswedana Ritual, a synchronised massage with two therapists working in perfect unison to achieve total relaxation, and the Royal Leela Facial that uses marma point massage and warmed poultices containing indigenous herbs to help tone and firm the skin promoting a radiant complexion. The spa features a dedicated selection of treatments especially for men: Indian Ayurvedic inspired treatments such as the use of heated volcanic stones and shirodhara as well as signature rituals to rebalance the body and restore energy are in house specialities. Each therapist at ESPA has undertaken an extensive training programme to ensure that every guest experience and treatment journey is of five-star standard. The design of the spa is intrinsically beautiful with exquisite Indian stone-carved wall panels and warm rosewood timber creating a surreal spa experience in which guests can find a true escape. This elegant and sophisticated décor combined with dark timber flooring, beautiful patterned ceiling designs and soft rich fabrics complete this warm and welcoming ambiance. The private spa suite is a luxury in itself: a comforting, cocooning space of warm rosewood timber and soft furnishings, boasting a steam shower and jetted bath. 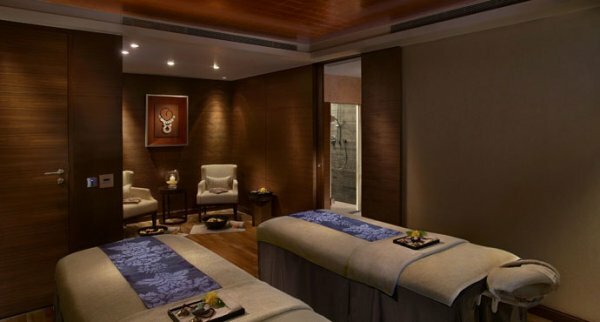 In a city so full of visual stimulation and chaotic beauty, the spa, by contrast offers a peaceful serenity, that allows each guest to simply relax, unwind and harmoniously embrace the traditional warmth of The Leela Palace New Delhi. The Fitness Center is an ideal place for the health conscious. It houses complete state-of-the-art exercising machines with individual touch screens and i-pod docks on treadmills. A health bar is also there to give the best to your body. To ensure visitors have a relaxing time at The Leela Palace we provide a vast array of services to ensure guests’ needs are met.It includes:4 Restaurants and a Bar,Baby Sitting Service,Florist,Gymnasium,Electronic safes,Swimming pool,Mini bar,Spa,Travel Desk,Car Hire Service. Spread over 10,400 sq. ft, the meeting and event rooms at The Leela Palace New Delhi provide the perfect back-drop for your esteemed needs. Both lavish and intimate, the event rooms at The Leela Palace New Delhi can host both professional and family events. The banquet halls overlook onto the restful calm of the hotel’s palatial gardens. The catering team is ever-ready to tailor to the wishes and requirements of our guests while planning the logistics and providing personalized service from the start to the finish. Each of the meeting rooms and function rooms are meticulously orchestrated and tailored to according to each guest’s wishes. Each event rooms boasts the newest audio-visual and communication capabilities, retractable projection screens, theatrical lighting bars and built-in track lighting. Each component of our service adds to make this an out of the ordinary experience. 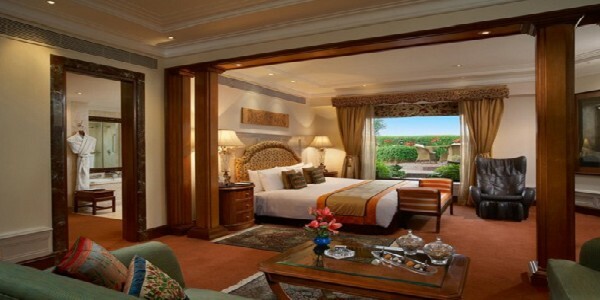 Experience The Leela Palace New Delhi and stay in our uniquely luxurious rooms and suites. Each room is furnished in an opulent yet contemporary style. Superior luxury accommodations include suites with private infinity edge pools. Splendid décor, perfect service and the state-of-the-art amenities are a few of the conveniences that our guests can enjoy to in our Grand Deluxe Room. Measuring 550 sq ft, the Grand Deluxe Room at The The Leela Palace New Delhi is known to be the most spacious grand luxury entry-level rooms in the city. Each of these 121 rooms is equipped with modern facilities and five-star amenities. Spread over 592 sq ft., the Royal Premier Room is exceptionally designed and has its own spacious seating area ideal for relaxing after a hard day of working, sightseeing or shopping. All 83 Royal Premier Rooms are finished with elegant marbles; spacious wardrobes and detailed artwork to further add a touch of class to these comfortable guestrooms. Sprawling green gardens views are standard for the Royal Premier Rooms. 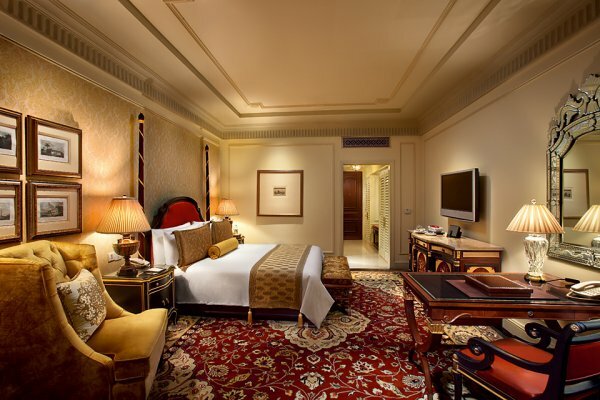 The facilities and square footage of the Royal Club Rooms are of the most luxurious and largest in the city. Benefits of staying on the Royal Club floor include exclusive check-in, checkout and a 24-hour butler service. 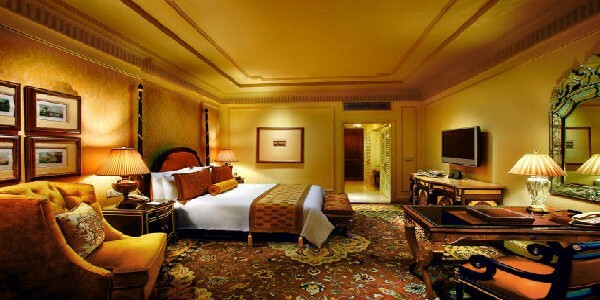 Guests can enjoy an unparalleled Royal experience that is not available amongst other five star hotels in New Delhi. Food and beverage refreshments are offered throughout the day in the Club Lounge Facility.Limousine service is provided for airport transfer. 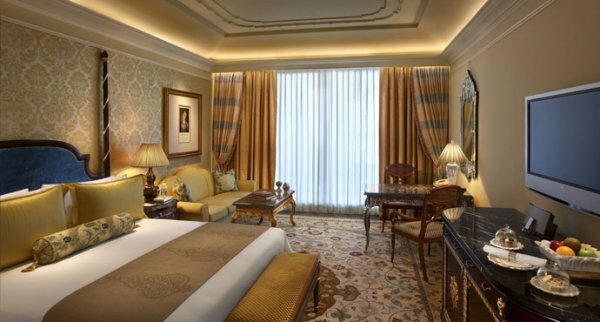 This luxurious suite has all the glitz you’d expect from of an ultra luxurious hotel like The Leela Palace. Packed with all the sumptuous amenities and rich handicraft tapestry, brocades and soothing wooden floors, these two suites are one of the snazziest suites among the Business Hotels, New Delhi has to offer. The magnificent view overlooking the capital city of New Delhi adds a distinct charm to the grandeur of these 840 sq. ft. suite. Indulge yourself in extravagance in one of The Leela Palace New Delhi’s seven Luxury Suites. Overlooking the manicured gardens, these 970 sq. 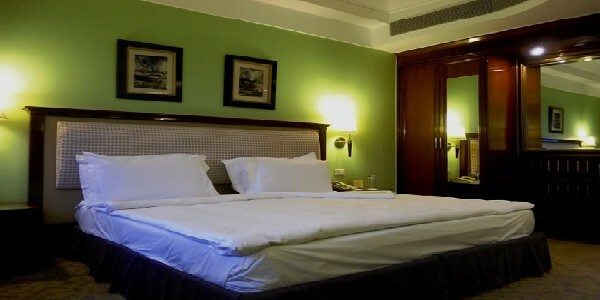 ft. suites offer an experience in Delhi like no other. Setting new benchmarks for luxury accommodation, The Leela Palace New Delhi assures palatial pampering with the confluence of traditional grandeur and contemporary innovation. The Grand Suite, measuring 1,090 sq ft, is designed in a grand Indian theme with vaulted ceilings to portray its warmth and opulence. The Grand Suite has a private plunge pool and Jacuzzi that overlooks the city. The oversized windows offer a picturesque view of the surrounding lush landscaped gardens. 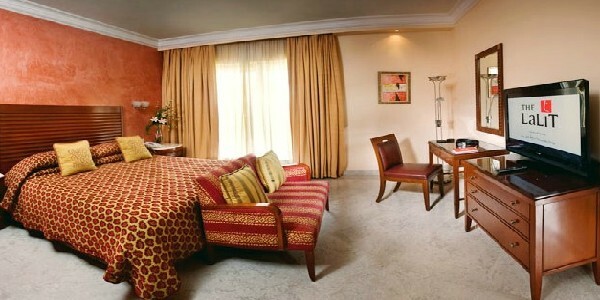 The Grand Suite comes fully staffed and ready as per the guests’ personal requests. 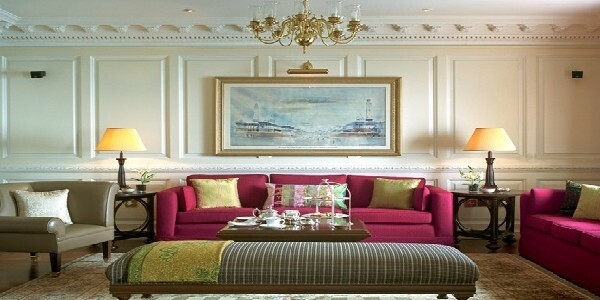 Enjoy a lifetime experience at the Royal Suite of The Leela Palace New Delhi. This grand suite measures 1520 square feet and manifests a luxurious and splendid aura making it one of the most famous suites of the hotel. As you enter, apart from the modern in – room comforts, an ornate floor to ceiling door opens to an ‘open to sky’ plunge pool with a Jacuzzi. Feel the ambience by relaxing in the plunge pool of the bath or rest on the plush decorated bed and sofas of the room. Experience the true blend of Lutyens’ inspiration at the Maharaja Suite. Its beautifully carved brocades in the bedroom, exquisite artwork and dining area highlights this utopian suite . The six bay suite comes with state-of-the-art facilities and amenities such as a complimentary chauffeured Rolls-Royce, 24 hour butler service, spa rooms, jazuzzi, walk-in wardrobes, private gymnasium and unparalleled service as per guest request. Understanding the guest’s need for privacy and enhanced security the suite is equipped with bullet-proof glass and a direct private elevator. The four exclusive restaurants and bar at The Leela Palace New Delhi offer cuisine and service that will surpass any guests’ expectations in the capital. One can dine casually all day at the glass restaurant, The Qube or formally at the Royal kitchens at Jamavar. If catching up on some reading or enjoying a drink is what you crave, there is not better venue than The Library. Furthermore, the European influenced restaurant, Le Cirque, has opened its doors in Asia for the first time on the 10th floor whereas our Japanese speciality restaurant, Megu, can be located on the Lobby level. 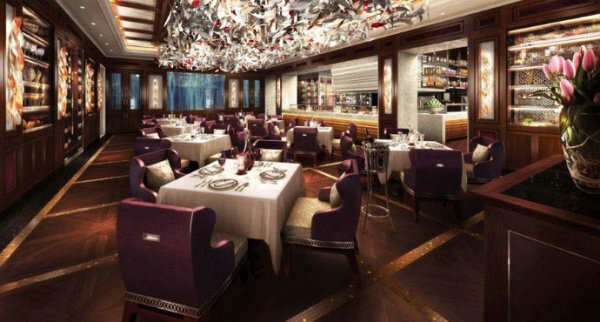 Located on the lobby level, The Qube is an all-day dining restaurant at The Leela Palace New Delhi. Named after its shape, the restaurant, housed in a striking modern ‘glass-house’, overlooks the hotels expansive lawns and lush gardens. Described as a ‘haven for calm,’ The Qube, which seats 144 guests comfortably, offers an a-la-carte or buffet dining experience. One can explore the nuances of the finest Indian and international cuisines serving your traditional and contemporary favorites. The Qube has an open kitchen that allows our chefs to interact with the diners. Savor the rich and varied flavours of the Royal kitchens of Jamavar, an exclusive restaurant that brings alive the rusticflavours of Indian cuisine in a perfect blend of fine dining and Indian hospitality. Jamavar, which has a seating capacity for 58 guests, is decorated with a fusion of traditional and modern Indian elements such as the ornamental Indian motifs on the walls and the handmade wooden screens. The diversity of the country’s culture is reflected in the variety of Jamavar’s menu. One is able to order a range of specialties such as kebabs, tandoori, biryanis, Indian curries and our famous breads. With the finest dishes from the royal kitchens served in a traditional yet contemporary ambiance, Jamavar takes the fine dining experience to a different level. Le Cirque is Asia’s first international French – Italian gourmet restaurant in Delhi and maintains its concept of “controlled confusion” complimenting an eclectic mix of contemporary French and the classic Italian cuisine. Indulge in an ambience that is fashionable and in an atmosphere so sophisticated and stylish, complimented with rich accents of rustic earthy tones and mood lighting to enhance the fine dining experience. 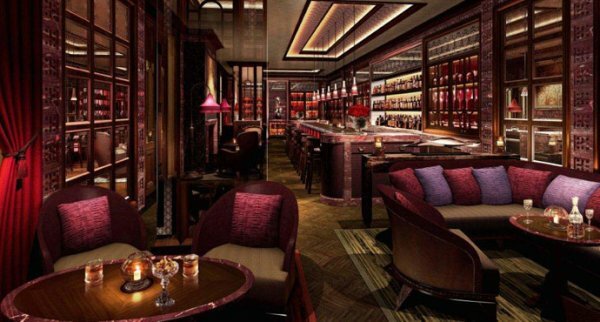 New Delhi’s most sought after restaurant features an avant garde bar lounge serving premium spirits to set the tone. The restaurant also offers an impressive wine list with over 80 labels of Italian wines and 100 labels of French wines and a privilege of three private dining rooms where you can relish tempting French and Italian delicacies straight from the Chef’s kitchen. Located on the 10th floor of The Leela Palace New Delhi, the 144 cover restaurant offers special seating pervading the metallic show kitchen, exclusive board room suitable for key meetings, a Chef’s table and marvelous alfresco dining option overlooking the city’s skyline. Le Cirque is one of the strongest gourmet brands world over. Some of the signature dishes at Le Cirque include: Arancini Risotto, Mama Egi’s Ravioli, Tuna in Pistachio Crust, Paupiette of Black Cod and Crème Brulee. Each of the dishes offered are authentic and classic allowing guests to experience the truly innovative cuisine. Guests can also savor some of the Le Cirque classic dishes which are served at other locations of this world-famous Italian restaurant group. Over the years, this classic restaurant has become synonymous with high-glamour dining in New York and continues the trend here at Chanakyapuri, Delhi. Finished with plush mohair, velvet sofas and teardrop chandeliers reflected in a ceiling of glass, The Library at The Leela Palace New Delhi is astylish hideaway for an intimate tête-à-tête. Enjoy the wide collection of premium spirits, cocktails and wines at the bar while relaxing and catching up on work or pleasure. Med-Asian bar snacks such as chilli and lemon popcorn and mini Thai fishcakes with crème fraîchetartare dipping sauce are some of the chef’s specialities. Meaning “blessing” in Japanese, this modern Japanese restaurant at The Leela Palace New Delhi has the best of Japanese cuisine, sushi, and sumibiaburiyaki arguably in the country. 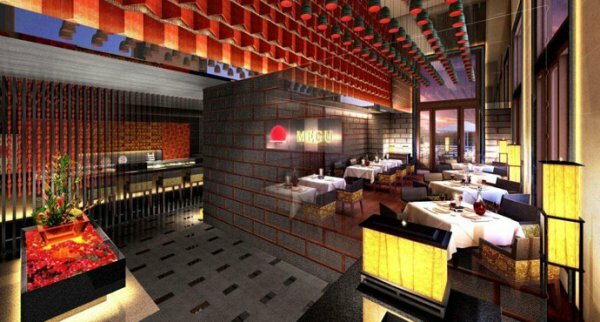 Besides offering a high quality environment, Megu delivers outstanding food quality, brilliant design and first class service. Megu is a harmony of all the finest and rarest ingredients found from around the world. The décor of the restaurant is filled with customary Japanese interior accents, complimented with a contemporary ambiance. With emphasis on cutting-edge yet serene aesthetics, Megu specializes in highly refined selections of hand-made tofu, fresh organic edamame and authentic smelts, flown in from all parts of Japan. The wine list is as expansive as the dining menu; wine and varieties of sake and sochu are sourced worldwide to compliment the cuisine. The rich fabrics, highest grade wood materials, and the artistic integrity of this restaurant ensure the customers of a spiritual and a purifying experience. The Lobby Lounge is the perfect setting to enjoy light refreshments or afternoon tea in the grandeur of the expansive lobby. Indian warmth infused with classic Leela hospitality creates an abundance of ambience and comfort for both our guests and visitors.